Three months have passed since my last favorite baby products post, and we have a new list of must-haves to share. First up — Sammy’s most significant development since three months old and possibly his current favorite activity — eating. The space saver high chair from Fisher-Price is convenient if you have a small kitchen and dining room like we do. It has a five-point harness system to keep our squirmy guy safe, and it converts into a toddler booster seat to use later. The cover is removable and washable, and the tray stands up well to multiple cleanings per day. Because, well, kids are messy eaters. 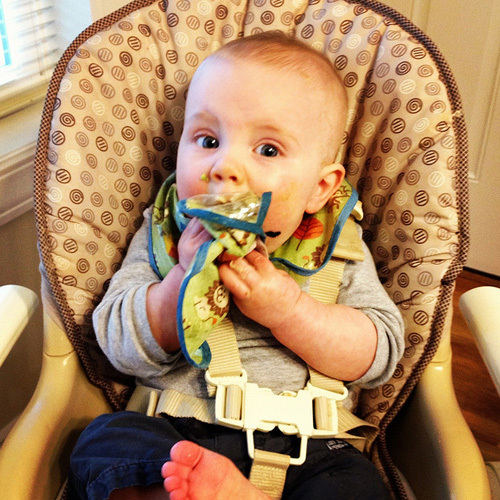 Sam started purees at four months, and we found the soft spoons from Munchkin to be best for his small mouth and gums. And when we introduced the sippy cup at five months, the Nuby cups were easiest for him to hold. We do like Bjorn bibs, but in the beginning, they were too wide and stiff for Sam to really move his arms and reach for food. So we bought a few easy wipe bibs from Target, and they’re great. Apparently they’re tasty, too. 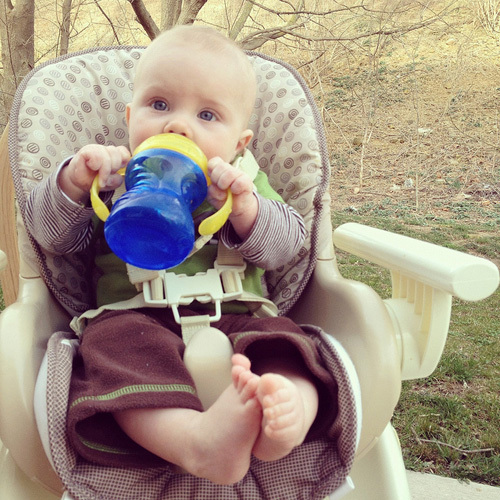 Speaking of bibs … Green Sprouts waterproof bibs are the best we’ve found. They really are waterproof — a necessary feature if you have a drooler like we do. 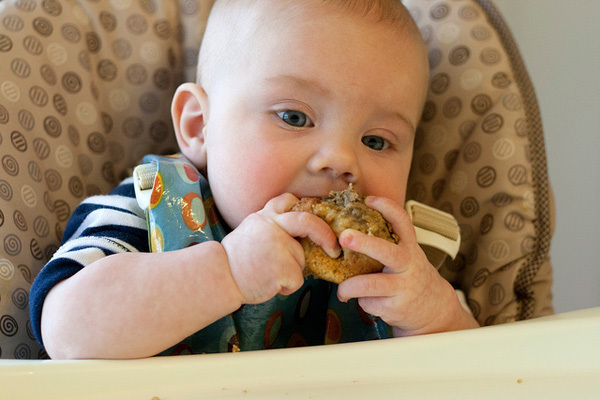 Finally, a few weeks ago we introduced Sam to the Baby-Led Weaning approach, and we haven’t looked back since. But before we placed an apple slice and cucumber spear on his tray, I read the Baby-Led Weaning Guide, which introduces the concept and provides instruction, encouragement, and recipes. If you’re looking for more food suggestions, I also recommend the cookbook. As I said in Sammy’s six-month letter, his play has become more deliberate and interactive. 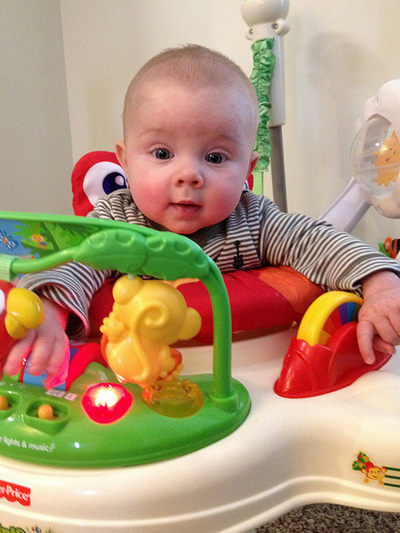 He loves to bounce in his rainforest jumperoo, hit the keys on his musical table, and spin his top. 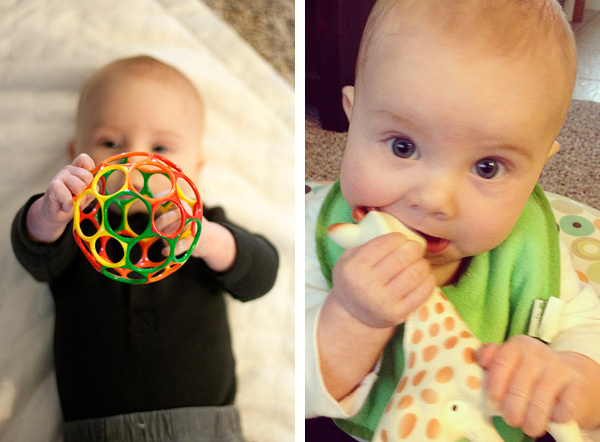 Before he was able to sit on his own, he spent playtime rolling around and reaching for the O ball or Sophie — still two of his favorite toys. Also ranking high on his list: the flip phone and the rings that hang from his car seat and stroller. Oh, and the stroller? Yeah, we have three. One kid, three strollers. That’s how we roll. The Snap N Go, which I still use if Sam falls asleep in the car seat while we’re out running errands. 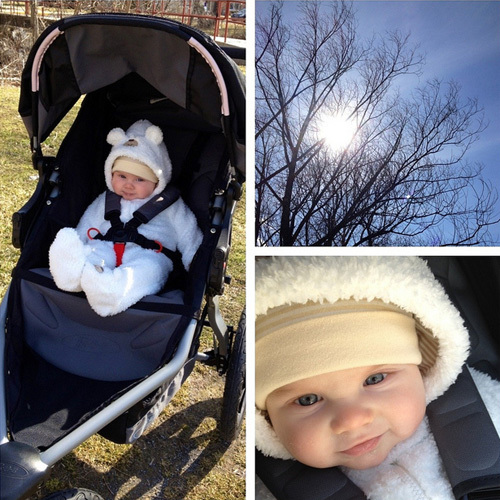 The umbrella stroller, compact and lightweight and perfect for travel. And the BOB. Oh, how we love the BOB. It was certainly an investment, but Sam and I use it every day. It’s easy to push and to steer, and it’s even comfortable on trail runs. Sam approves! Oh, sleep. We hit a major sleep regression pattern around four months. 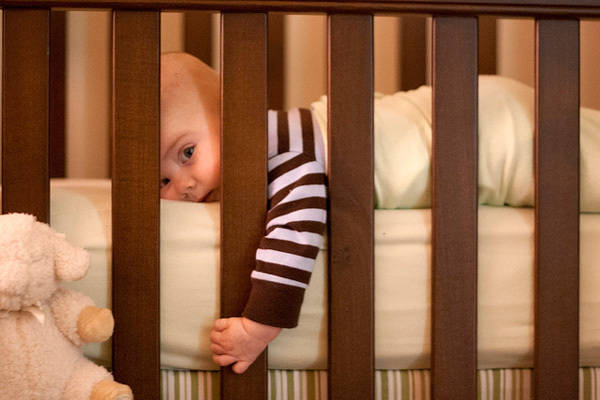 Sam was up at least four times every night — more often than when he was an itty bitty newborn. 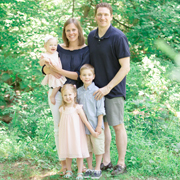 After about two weeks of getting up multiple times to re-insert the pacifier and nurse, I was ready to try “sleep training.” Enter Dr. Richard Ferber and his book, Solve Your Child’s Sleep Problems. It’s an interesting read even if you don’t agree with his approach. We ended up doing a modified version of his method, and within just one week, Sam was sleeping soundly from 7:30 pm until about 4:00 am. He’s even made it until sunrise on several occasions. Yes, he’s almost sleeping through the night. Woohoo! 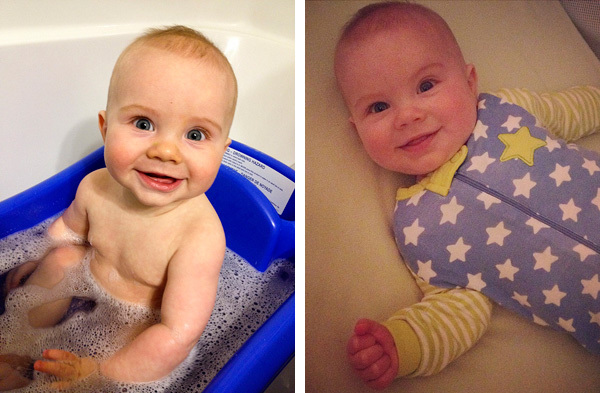 We changed up a few other parts to Sam’s nighttime routine around four months. We still bathe him in the blue tub (though now he sits on the toddler side like a big boy), and the stretchies from The Children’s Place are still his/my favorite jammies. But he now sleeps every night in the Halo SleepSack with the Conair Sound Machine. This sound machine is amazing! It plugs into the wall, so we run it all night (and during naps, too). Not only is it soothing, but we don’t have to tiptoe around the house for fear of waking the baby. Another new and necessary addition? Breathable bumpers. Keeps arms and legs inside the crib, provides just enough cushion for our boy who moves a lot in his sleep, and gives this momma peace of mind. Wonder what we’ll fall in love over the next three months? Something tells me the list will include baby gates and cabinet locks. I JUST ordered sippy cups! If they don’t work out, I’ll check out the NUBY ones. Henry and Sam have similar pajama wardrobes, as he has the star/stripe pair too. Next 3 months? Yes…baby-proofing supplies. Walkers. Convertable car seat. You’ll start to hate onesies because he’ll move too fast. Sigh. Moves too quick! I guess I’ll be revisiting this post in about six months 🙂 Glad things are going so well!! He’s such a sweetie. That last picture is seriously awe. to. the. some. 🙂 Loved it.